An employer can justify a ban on religious dress that prevents a Muslim woman from wearing an Islamic headscarf (hijab) when in contact with clients, the European Court of Justice (ECJ) has ruled. The rulings come after courts in Belgium and France referred controversial domestic cases to Europe’s top court. The cases both considered what employers should do if a third party objects to an employee wearing religious dress while working on a third party’s premises. The Belgian case Achbita and another v G4S Secure Solutions NV involved a Muslim receptionist who was permanently contracted out to work for a third party. She informed her employer that she was going to begin wearing a headscarf in the workplace. The receptionist’s employer told her that the wearing of any visible religious symbols was contrary to its rules on neutrality, which applied during contact with clients. The employer subsequently amended its written rules on workplace dress and appearance. It introduced a uniform and banned workers from wearing any visible symbols expressing their political, philosophical or religious beliefs. The Muslim receptionist’s refusal to go to work without a headscarf ultimately resulted in her dismissal. She brought a domestic discrimination claim and Belgium’s labour appeal court referred her case to the ECJ. In the similar French case Bougnaoui and another v Micropole Univers, a Muslim IT engineer who wore an Islamic headscarf was told by her employer to remove it while visiting clients, after a client’s staff complained. The Muslim employee was dismissed after she refused to comply with this request from her employer, which has strict rules about staff expressing or displaying personal beliefs when with clients. The employee brought a claim in the French domestic court, which referred the issue to the ECJ. 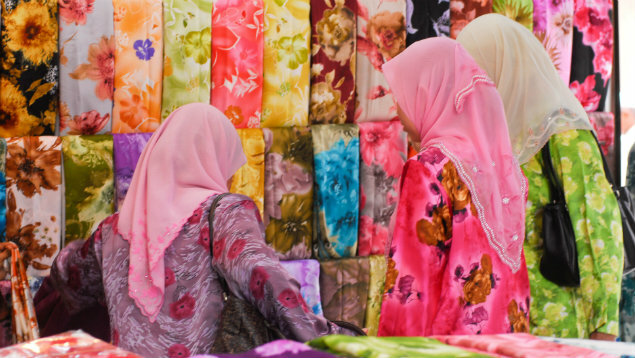 Should a female Muslim employee be allowed to wear a veil or headscarf? The ECJ has now given its judgments in both the Belgian case Achbita and the French case Bougnaoui. In Achbita, the European Court held that, as long as the rules are applied consistently across the board, a rule requiring staff to dress neutrally cannot constitute direct discrimination. the rule cannot be justified. According to the ECJ, an employer’s desire to project an image of neutrality towards its customers is a legitimate aim, particularly where the rule is applied to staff who come into contact with customers. However, the European Court cautioned that the employer’s means of achieving this legitimate aim must be appropriate and necessary. For example, the ECJ left it the Belgian domestic court to ascertain whether or not, rather than dismissing the claimant, the employer in Achbita could have offered her a job that did not involve contact with customers. The ECJ sent Bougnaoui back to the French domestic court to consider the case in light of the guidance it gave in Achbita. Phil Pepper, employment law partner at Shakespeare Martineau, said: “This is an interesting decision by the ECJ, but it will not mean that UK businesses will be able to ban religious clothing in the workplace overnight. It will not be that simple. A blanket ban on headscarves is not the answer and creates significant grey areas for many employers. “Implementing dress neutrality policies is extremely difficult and in most cases, not realistic in the modern workplace. Any organisation that wants to adopt such a policy must give serious thought to how it would be implemented and received by employees. Get it wrong and employers could easily end up on the wrong side of a discrimination case. Khurram Shamsee, partner at law firm DAC Beachcroft, said: “This judgment provides welcome clarity that these generic dress code rules do not amount to direct discrimination and, equally, that an employer cannot simply rely on the Genuine Occupational Requirement (GOR) exemption. “We are left with the position that the rules are likely to amount to indirect discrimination. However, the acid test in any given case will come down to the balancing exercise to see if those rules are justified. More on the ECJ decisions in Achbita and another v G4S Secure Solutions NV and Bougnaoui and another v Micropole Univers, including analysis of their implications for employers, is available on XpertHR.